The best-selling album has inspired a heart-melting audio book. In Love Story, one of Christian music's most remarkable singer-songwriters brings to listeners her proven gift for mining the gritty soil of everyday experience and emerging with poignant gems of spiritual insight. 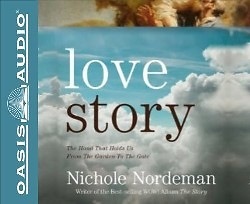 Based on the songs of the popular album, Music Inspired by The Story, Dove Award winner Nichole Nordeman takes us inside some of the pivotal moments of the people of Scripture, revealing a very human side that we've rarely glimpsed. In the process, she offers us startlingly frank glimpses of her own struggles and faith journey, inspiring us to take the hand of the One who walks with us -- who has always walked with us -- from beginning to end.